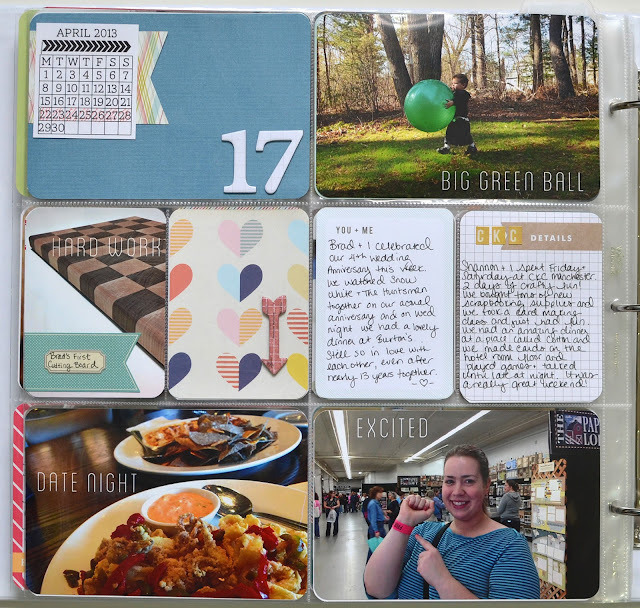 Welcome to Project Life 2013, week 17. If you're new to my blog, make sure you check out my post about my 2013 album. When I went to edit my photos this week I started with the one of our appetizers at Burton's, and just felt that photo needed a caption. I used one of my favorite fonts, Blanch, and added the words "date night." After that, I knew I wanted the entire spread to have captions on the photos. Doing this also meant I didn't have to do as much journaling, which I loved. 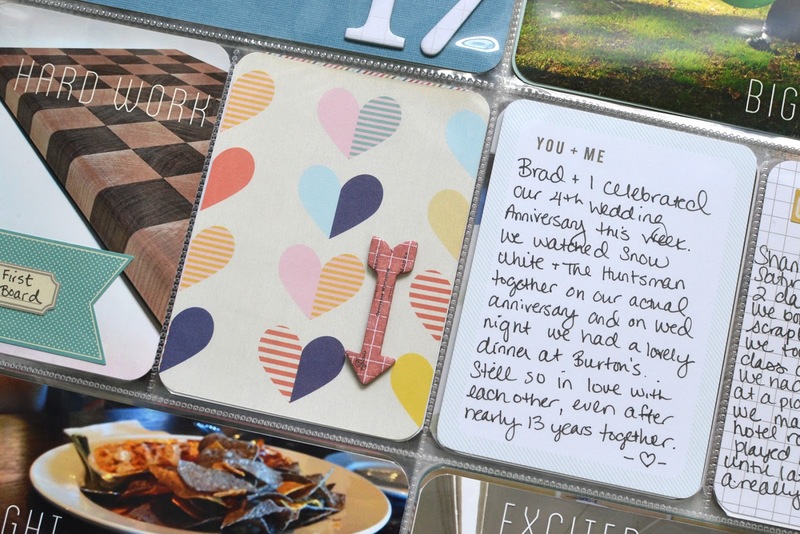 I used a couple of cards from the Studio Calico Project Life kits (I mix all my kits together now so not sure which one) to document our fourth wedding anniversary. I used an arrow from Heidi Swapp and misted it with Tattered Angels Glimmer Mist in Sienna. (I just realized now that I forgot a photo of this page without the small insert at the top - it's just a card from a restaurant Shannon and I went to during our weekend at CKC Manchester). On this page I added a wood veneer from Studio Calico. I left it untouched, because I just love the wood circles as they are. I had a small insert this week - it's a Design I page protector cut down to just one of the pockets. 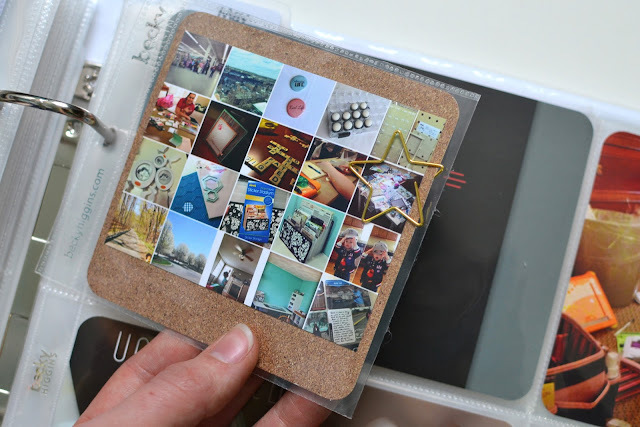 I cut down a 4x6 Studio Calico card and added a small version of the photo collage I'd posted here on the blog on the front. The star paper clip is from a Studio Calico kit as well. Love those! On the back I included the wording from my blog post, using the Blanch font again. I really love how this spread looks! And it came together quickly, which makes me double happy. Have a great week everyone! fabulous font; love your work; love the titles on each photo. I love doing that too on my pages for the same reason. Thank you! I haven't done text on too many photos, I'm usually scared to do that! But I love how this looks so I'm definitely going to have to do it more often! I really love the way you treated the mini collage. Super clever! Love your project life pages! 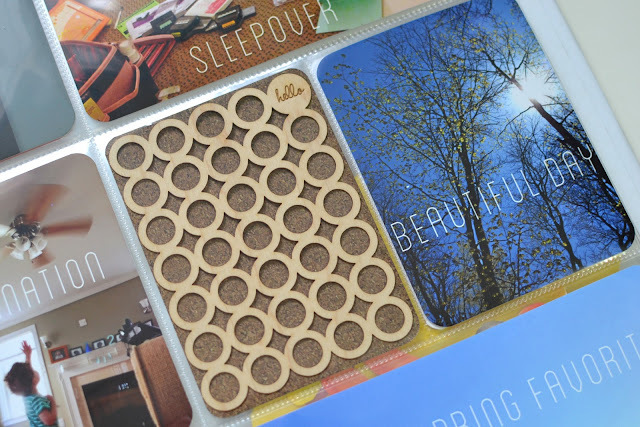 And I love, love, love that Studio Calico wood veneer thing! Soooo cool looking! I really like the photo collage too. Great looking pages...they are just perfect. 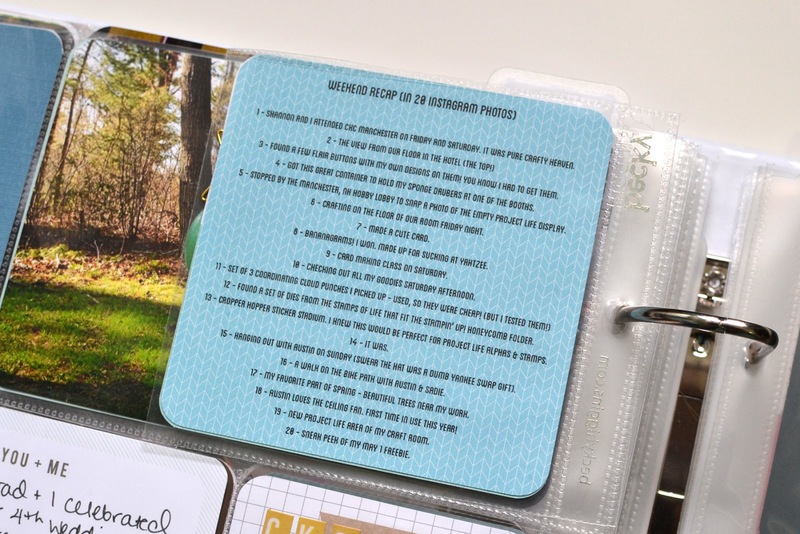 OK, tell me how you photograph your pages so you don't get glare. 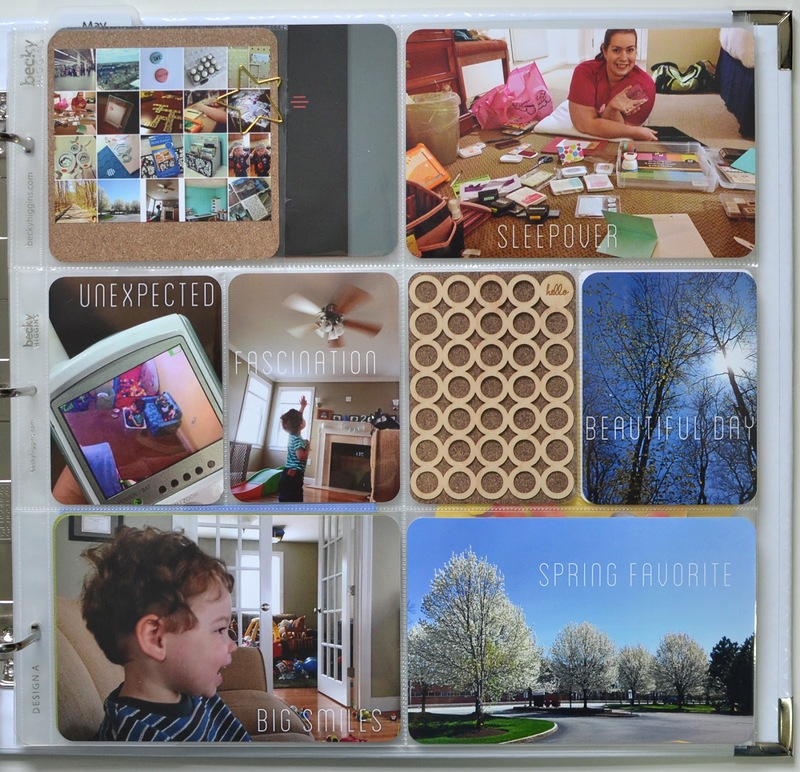 I've tried every way I know...and have been taking my photos/cards out of the insert pages but that is a hassle, too. You don't seem to get all the glare. Any tips? Well, I photograph mine from above, in front of a window but out of any direct light. I have to be far enough from the window that I don't get the glare, it often takes some repositioning. If you do it during the day and about 3-4 feet away from the window it should be far enough away. I also find early morning or late afternoon is best to avoid too much sunlight. I don't know, just luck? Sometimes I do get glare! Thanks! You're right...sometimes I have the same result...some days are definitely better than others! :) Thanks for responding!!! Nice clean pages. Love the look of those cork inserts, your photo collage and lots of your photos in general. It all came together so well. The words on the picture are a nice touch too. LOVE the font you have on the photos - and the wood circles. Love the font too! Thanks! Love the captions on all the photos. That'll be fun! Especially if you take lots of Instagram photos, so easy to make a collage from them. 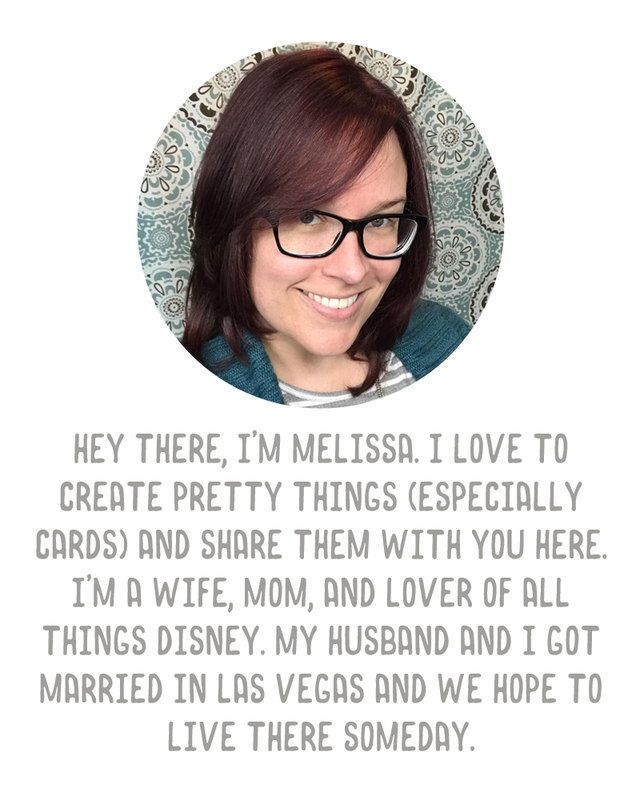 Hey Melissa! I'm in Vegas as well! 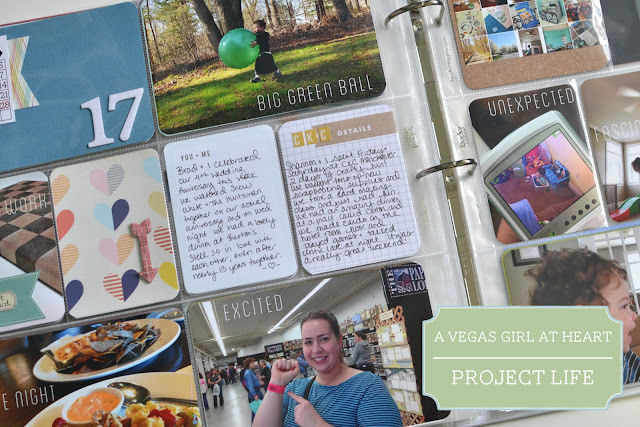 So great to find other Vegas project lifers blogging! Have you go to HL yet?? I am going this Friday again (4th time since the release) hoping to find the midnight and honey kit! Also, will you be going to CKC at south point? I actually don't live there (yet). It's our favorite place and we were married there. We hope to retire there one day and honestly that City brings me to life! :) miss it!